Saturday was very slow on cable, with the highest 18-49 rating a 0.37 for BELLA AND THE BULLDOG on Nickelodeon. Spike’s AUCTION HUNGERS was at 0.31. 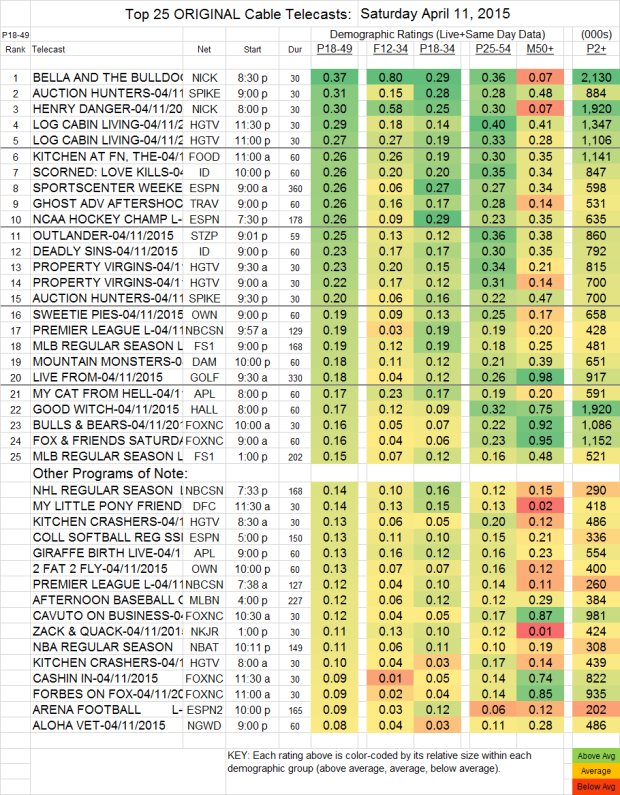 LOG CABIN LIVING (HGTV) was at 0.29/0.27, down more than a tenth from last week, with PROPERTY VIRGINS at 0.23/0.22. THE KITCHEN AT FN (Food) gained 0.05 to 0.26. OUTLANDER (Starz) lost 0.02 from last week’s season premiere to 0.25. THE GOOD WITCH (Hallmark) rose 0.04 to 0.17.